Cook Cemetery is on Rt. 7 near Maud, across the creek and up through a meadow, overgrown, fenced, lots of sunken graves unmarked. 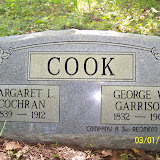 Click on the above picture to see a slideshow of the tombstones in Cook Cemetery. Photos were submitted by Donnie Huggins.